Popped-Grain Fun, Cocktail Mixers, Vending-Machine News & More! 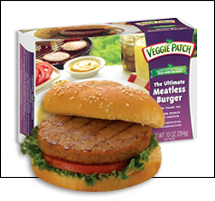 Veggie Patch The Ultimate Meatless Burger - If you're gonna call a burger "The Ultimate," ya better have the goods to back it up. Luckily, Veggie Patch does! These meat-free patties ROCK. Each one has 110 calories, 4g fat, 390mg sodium, 7g carbs, 2g fiber, 1g sugars, and 12g protein (PointsPlus® value 3*). Find these refrigerated (in the produce section) and also in the freezer aisle. Mini Pops Air Popped Sorghum Grain - Qualities we love in snack foods: delicious taste, low calorie counts, and adorable cartoon spokescharacters. These petite and crunchy kernels have it all! Try flavors like Baby White Cheddar, Subatomic Sea Salt, Hot n' Chilly Chili, Nano Pepper & Herb, and more. Each serving (1 - 1.5 oz.) has 90 - 120 calories, 1 - 1.5g fat, 0 - 160mg sodium, 19 - 29g carbs, 2 - 3g fiber, 0 - 16g sugars, and 2 - 3g protein (PointsPlus® value 2 - 4*). Bonus: A few flavors come in single-serving bags! Click here to track 'em down and here to order online. BREAKING PRODUCT NEWS!!! Cream Cheese from The Laughing Cow! New cheese from The Cow... Smooth Sensations Cream Cheese Spread is on the way! 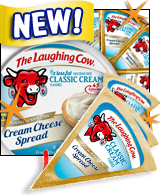 Just like The Laughing Cow's other spreadable cheeses, this creamy stuff comes in individually wrapped wedges packed in wheels, only the foil wrappers are GOLD (so cute!). There are four "1/3 less fat" flavors -- Classic Cream (which also comes in regular), Strawberries & Cream, Cinnamon Cream, and Garden Vegetable -- with only 45 calories and 4g fat per wedge (PointsPlus® value 1*). We've tried them all, and they ROCK. The new schmears are just starting to appear in stores, so keep your eyes on the refrigerated section of your supermarket. EXCITING STUFF, people!!! Ocean Spray Diet Cran-Cherry - This stuff is super-delicious (it tastes a little like cherry Jell-O), has just 5 calories per cup, and is ripe for punching up with a shot of vodka. And it's AMAZING mixed with Sprite Zero! Cascade Ice Sparkling Cocktail Mixers - These bubbly beverages are delicious and come in fun flavors like Pina Colada and Lemon Drop. And a cup has just 0 - 10 calories. Fizzy cosmo, anyone? 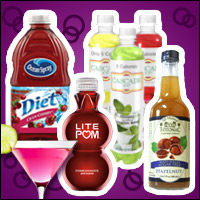 Lite POM Pomegranate Juice Cocktail - Here we have an incredibly yummy offering from the folks at POM Wonderful, with up to 50 percent fewer calories than regular POM juice. Choose from regular Pomegranate and versions with Blackberry, Dragonfruit, and Black Currant. A cup has 75 - 80 calories (PointsPlus® value 2*) -- perfect for adding a splash here and there! Totonac All Natural Flavored Syrups - We haven't tried these yet, but we're VERY intrigued. With zero calories per sugar-free serving, these syrups are sweetened with stevia and luo han (another natural plant-based sweetener). A good alternative to Sugar Free Torani if you're not into artificial sweeteners. Hungryvision is BACK and better than ever! Check out our recently updated video site, featuring HG Lisa's TV appearances (on Dr. Oz, Access Hollywood, TODAY, and more), fun recipe demos, behind-the-scenes madness, and so much more. Click and check it out! Prefer to view videos on YouTube? Check out the HG channel over there and remember to subscribe to it! ***No more selecting a vending-machine snack only to be shocked by the stats once it's in your hands. VendScreen enables consumers to check the calories, fat, etc., BEFORE purchasing... and the device can conveniently hook up to existing vending machines. Testing is reportedly planned for this spring, but many have already been presold. Can't wait! 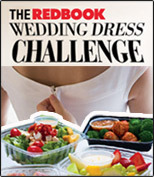 ***In the search for a "sweet spot" in terms of info placement on menus, a researcher instead found a "sour spot." One place people pay little attention to on a menu? The salad section. Don't hate on salads, people -- some of them are delicious! ***Sweet scientific advances! A naturally sweetened sugar-free energy drink called West Coast Chill is on the way... in a SELF-CHILLING CAN. You read that right; press the activation button, and the beverage temperature drops 30 degrees in mere minutes. "Cool" doesn't begin to describe it... ***Mirroring the behavior of those around us is a common thing, and it appears that mirroring can extend to eating. In a recent study, women exhibited a tendency to adjust their food intake to match that of their dining companions. This could be good or bad... depending on who you eat with. Time for a dinner party with other HG fans! That's all we’ve got. HG out! Video Fun at Your Fingertips! Today is the second Monday in February, which means it's Oatmeal Monday! Read up on old-fashioned oats and make some hot cereal STAT.